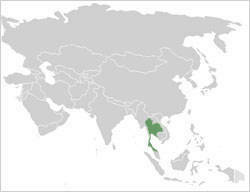 Thailand has become famous for sapphires for two main reasons, Thailand is today responsible for nearly 80% of the worlds trade of precious Gem stones including sapphires and rubies. 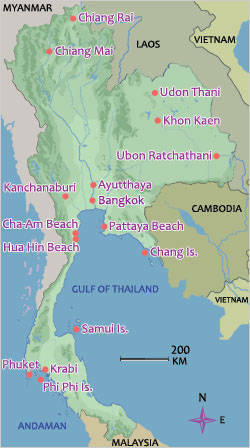 Regardless of origin Bangkok and the city of Chanthaburi ( Thai for City of Gems) in Thailand is where the vast majority of the worlds supply of gem stones are traded, bought and exported. Today this industry in Thailand plays a huge part in the country's economy and as Antwerp and London are to Diamonds Thailand is to Gem stones. You will find almost all the worlds top gemology laboratories have offices in Thailand including the GIA,AIGS and GIT all offering full gemology services and reports. Sapphire Ring Company have strong contacts here in Thailand with frequent visit to this country has enabled us over the years to establish strong relationships with some of the top gem dealers here, however today we have shifted almost all of our purchases of sapphires and rubies to Sri Lanka due to many complex treatments in chemically enhancing sapphires as well as finding it very difficult to establish a country of origin due the to variety of sapphires and rubies being imported globally here. Over the last 5 years Thailand has developed many new treatments for sapphires and rubies many of which are extremely difficult to detect, during the end of 2010 and into 2011 we estimated that 20% of all natural sapphires we bought from trusted gem brokers here were in some way enhanced outside the traditional gentle heat. Some of these new treatments are almost impossible to detect even by the most experienced gemologist which is why it is so important to have a full Laboratory report ( please see our pages on Laboratories ) on any precious gem stone. This is not to say that the gem brokers were being dishonest but with treatments like deep diffusion - lattice diffusion with synthetic enchantments are some of the new treatments which are coming into the market place today and even the most experienced gem gemologist are finding this stones impossible to detect without very valuable equipment which only the top gem laboratories have. 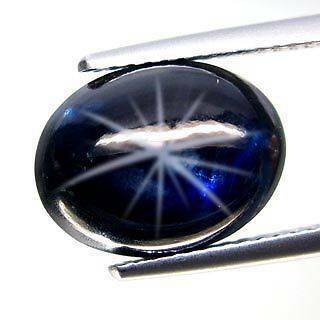 Diffusion treated sapphire, you can see on the outer layers of this stone were color has being added, if this sapphire was not cut in half it would look like a traditional blue sapphire with natural inclusions. 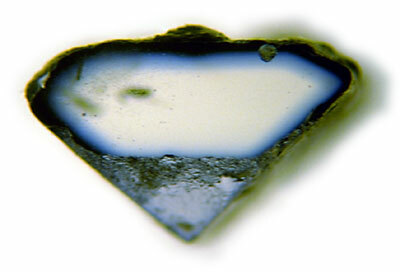 Today there is deep diffusion were the color can penetrate up to 3-4 mm inside the stone making detection much harder. This is in part why Thailand has one of the most advanced laboratories in the world, The GIT very much like the GIA here in the US is a non profit making laboratory set up and funded in part by Thailand to protect these valuable industry. This is not to say that sapphires from Thailand are all some how enhanced, its just being responsible for such a large proportion of the gem industry by nature people are always looking at taking stones of little value and enhancing them chemically to increase there value ( much like people who counter fit money or valuables paintings )sapphires and rubies can be sold for 1000's of dollars per carat and if you are unaware of these treatments in can be easy to buy what appears to be a valuable stone. 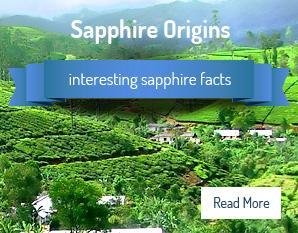 Over the years Sapphire Ring Co have being lucky enough to have bought some of the nicest sapphires in deep vivid blues to rich greens all from the mines of Thailand, these pages to come will cover sapphires from Thailand and the quality and colors which are found here. Thailand has and still does produce some of the finest sapphires in one of the most diverse range of colors found any where today. Thailand has become mainly famous for its blue and yellow sapphires today, the blue sapphires can be a little milky however there are some which carry a very vivid blue color with strong tones and hues. The yellow sapphires can rage from a light yellow to the famous cognac color deep yellow sapphires which are almost unique to Thailand. Many of the sapphires which come out of Thailand today will be heated, Thailand has some of the worlds best cutters as well as heating facilities. If you are looking at buying any sapphire from Thailand we would recommend that you have a report or ask to have a gemology report completed, there are many of the worlds top laboratories based here the most convenient laboratory would be the AIGS who offer a 4 hr service and have several offices in Bangkok. 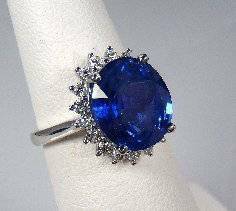 Remember please treat all sapphires or rubies as either chemically enhanced or synthetic unless shown offer wise many people fall into buying what they have being told is a natural sapphire which when tested turns out to be chemically enhanced. 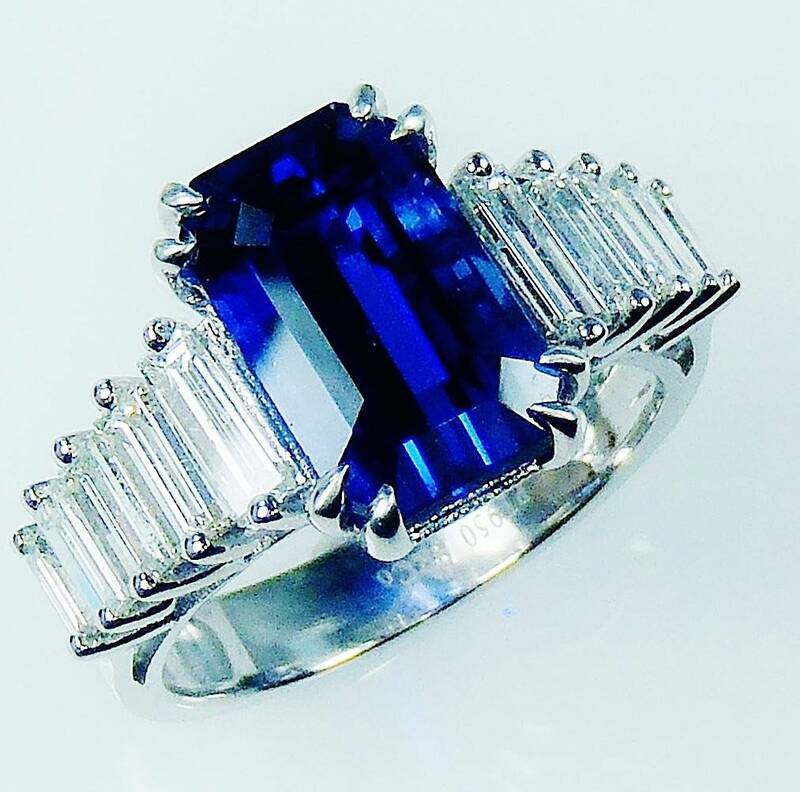 GIA certified 6.69 ct naturally heated Thai sapphire set into one of our 18 kt white gold and diamond custom ring's.